Journey to Jodhpur – snackettes. 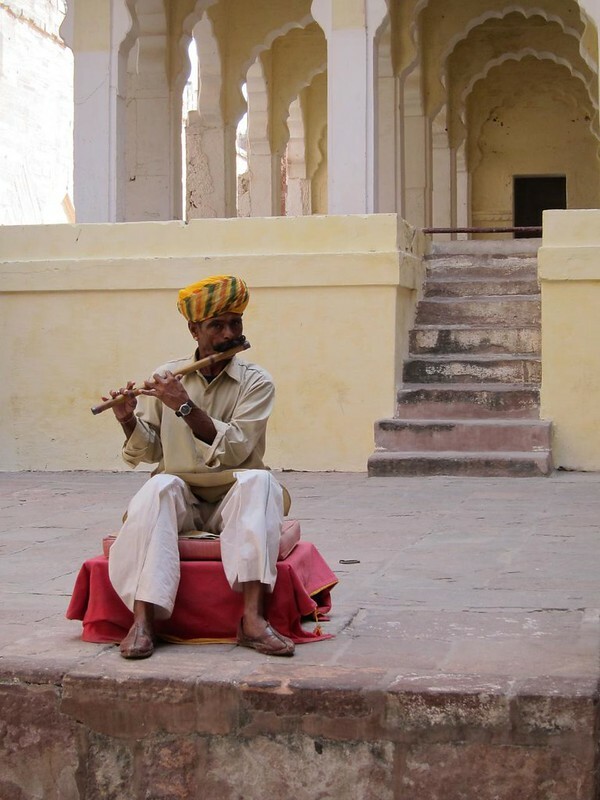 Our next stop out of Delhi would be the desert state of Rajasthan – one of the most exotic, traditional, “India-of-the-movies” provinces in the country. 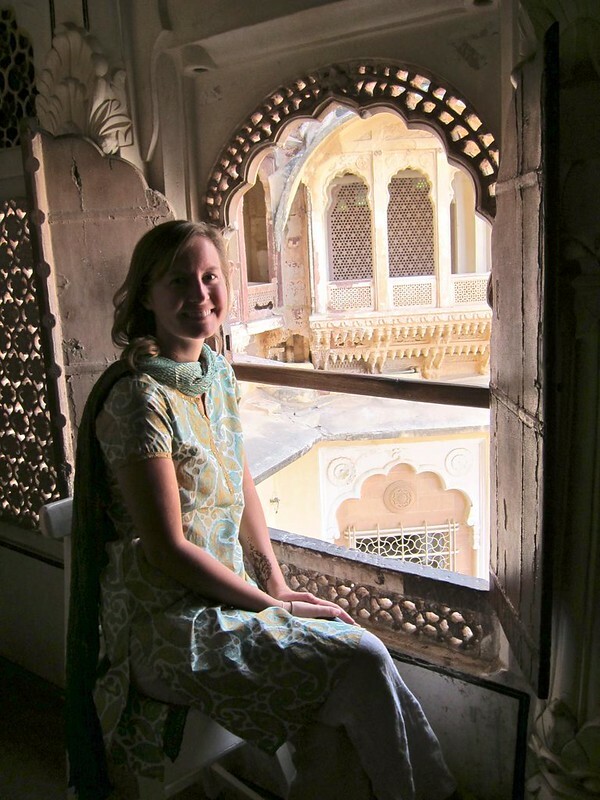 To get there, we would need to take an overnight train out of Old Delhi – simple enough, we figured. But this was India, and we were quickly learning that nothing (nothing) is simple in India. To book a ticket, we first had to wrestle with the Indian Railways booking site, which would tell us what trains run each route but not actually let us book them. We would also need to decide which class to ride in, as there are 1AC, 2AC, 3AC, 2nd, 3rd, Sleeper Class (which has no beds, and certainly no sleeping), Chair Car, unreserved, Luggage, waiting list, “reservation against cancellation” (? ), all with upper/middle/lower/upper side/lower side seats! Of course, once we made all these decisions (which took several days), we found that there were not any trains available soon anyway, as there are so many people in India, the seats on the train are heavily wait-listed weeks ahead of time!! To deal with this, India has made some tickets available just for tourists, but these must be booked in person. So instead of booking online, we had to book our ticket 4 days in advance by showing up in person at the New Delhi tourist booking office and wait in line for 2 hours. When we got to the front of the queue, there were no tickets for the train we wanted, so the ticket officer suggested that we go to a different city. Weird suggestion? Yes. Did we have a choice? Nope. 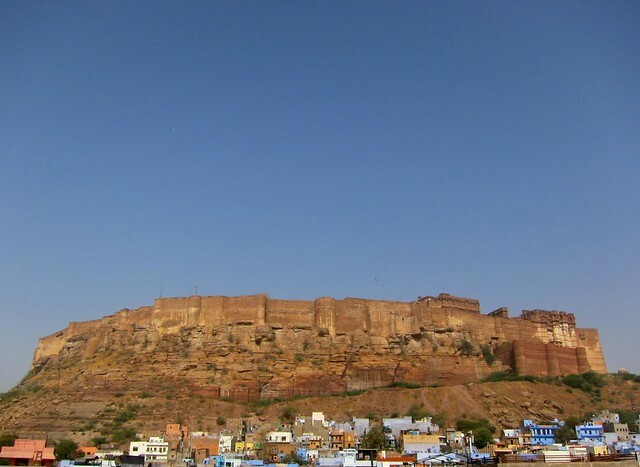 So instead of heading to our intended destination (Jaisalmer), we opted to go to the ancient “blue” city of Jodhpur (don’t you just love how we travel?). To catch our train out of Delhi, we took an auto-rickshaw to the railway station, a journey that had us weaving through the streets of Old Delhi just after dusk and feeling more unsafe than I had ever felt on the whole of our trip. A place that we had thought looked like a dirty construction zone during the day, was now a place that looked like a post-apocalyptic war zone at night. The streets were ominously dark and dusty, lit only by occasional streets lights whose beams cut through the thick haze and dust kicked up by the traffic. Papers and colorful food wrappers whirled through the streets in miniature tornadoes. To complete the set, a man urinating, not just on the side of the road, but in the median of the roadway. We dodged cows, other rickshaws, more urinating men… around fallen cement blocks and people sleeping on the asphalt… I looped my bag tight around my arms and tucked myself into the dark corner of the open-sided taxi. We eventually reached our train and located our 4-person sleeping berth, which we shared with two other men. One was dressed in a white robe, white sandals, and a white rope for a belt. He wore perfectly round thick-rimmed glasses and had frizzy hair that stood several inches from the top of his head. I’ll call him Jesus-Harry-Caray. Before the train started off, JHC offered his top-bunk to Scott (so that Scott could be closer to me, we thought, in reality, it was so JHC could entertain adjacent passengers with tea and loud conversation in his lower bed throughout the course of the night). As they were switching seats, I blatantly laughed and pointed out that a train employee must have left a broom up in Scott’s new bed… Only after JC went to grab it off the bunk did I realize that it was a religious piece… his religious piece (in my defense though, it was in fact a broom– a 4 foot-long silver rod with a white fluffy plume on one end.. a fancy broom!). I didn’t have to feel embarrassed or guilty for long, as JC loudly passed horrible gas and yelled into his cellphone all night. His loud chatter at his tea party in the bunk below me woke me up well before dawn, but that didn’t stop JHC from yelling to me, “Good morning! 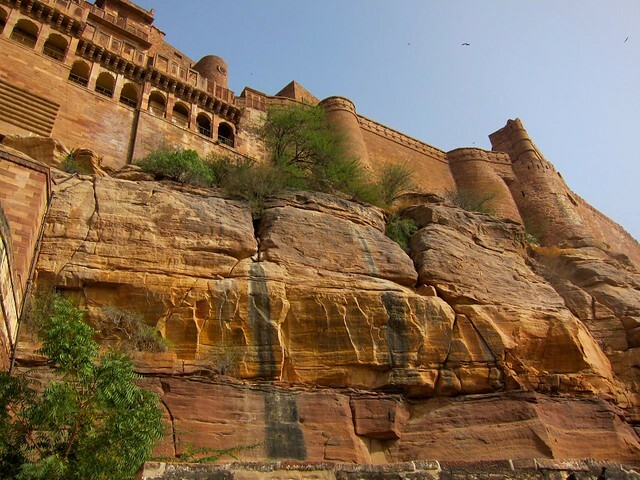 We have reached Jodhpur!” once we finally arrived. Thanks…. (our alarm then confirmed). We arrived in Jodhpur at 5am. 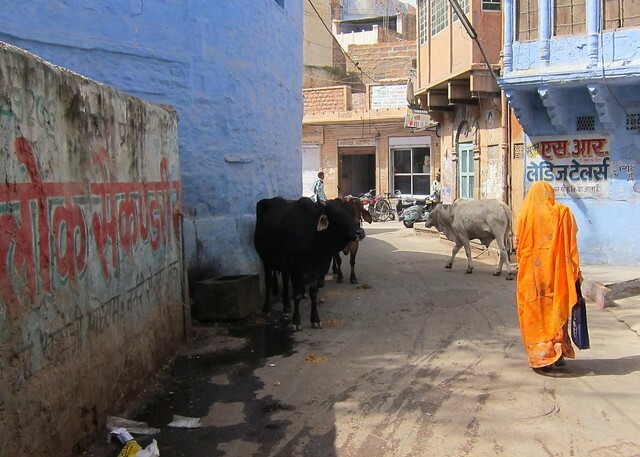 We stumbled off the train and into our waiting rickshaw, which drove us through a veritable maze of crumbly buildings, cows, dirt, and more poop. What are we doing here? 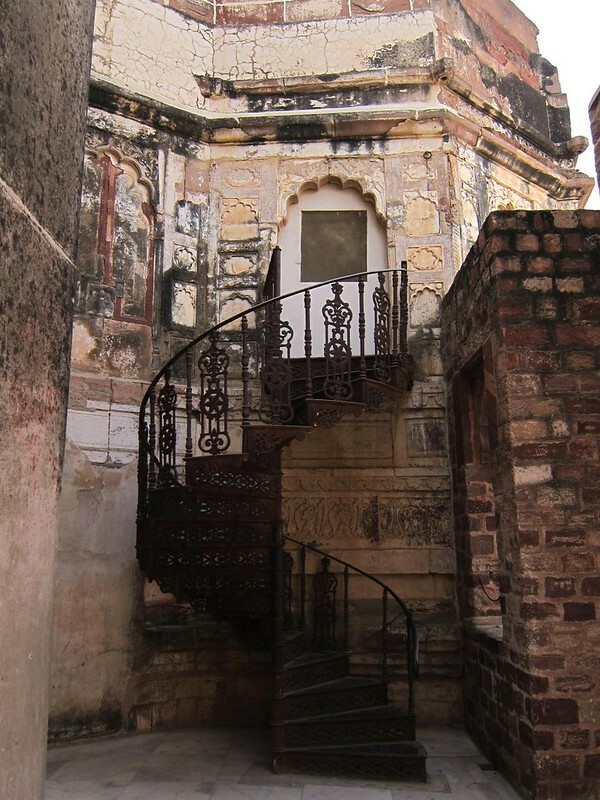 As we neared Old Jodhpur, things became noticeably more quaint and historic (no less poop, of course– more in fact, yes definitely more, but still charming). Our guesthouse manager escorted our weary bodies up 4 flights of tall stairs to the roof of our guesthouse, our blurry, red eyes struggling against the rising sun, as we got our first glimpse of Old Jodhpur– it was all blue…..
From the roof, we had a view over the entirety of the old city, and I spent hours mesmerized by the real-life dollhouse playing out before our eyes– a woman washing colorful saris in the house across the way, women cutting vegetables on the rooftop just below us, a man who would climb up one ladder, disappear, and appear a few minutes later in another building’s doorway. The buildings seemed to be laid out in complete randomness, being placed at odd angles to one another, with rooftops all reaching to different heights. 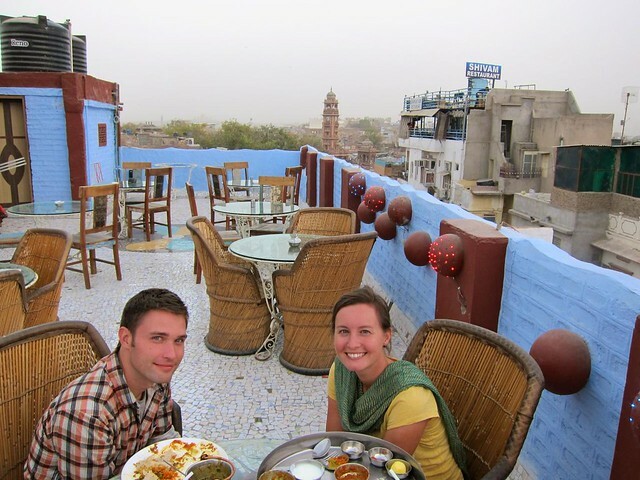 It was our first introduction to “rooftop living”. In India, rooftops are an extension of the rest of the house… a place where chores are done and a place to relax, come evening-time. We’ve noticed that they also provide the fastest mode of communication– just go to your rooftop and yell across to your neighbor. Apparently in conservative villages, rooftops are also the means of communication for women who aren’t allowed to leave their home unaccompanied – I’m convinced that these rooftops are where the world’s next revolution will be launched. 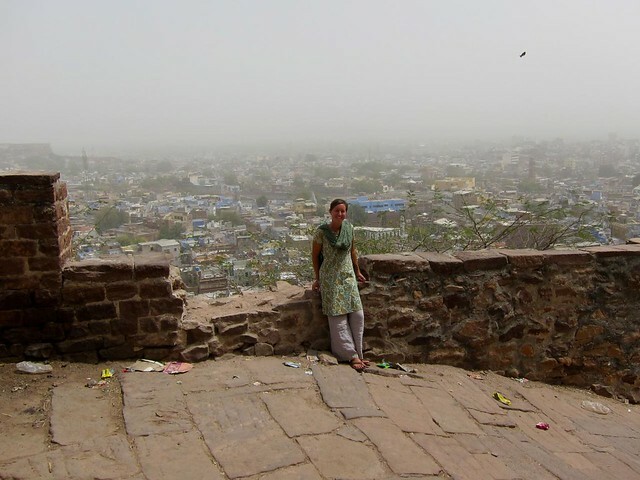 Our first full day in Jodhpur, we hiked to Mehrangarh fort, a massive hill-top structure built in the 1500’s and the only fort in the world never to have been taken by force. The sheer angle that you would have to take to approach the fort surely took care of that. On our way to the fort, we were stopped by a young man claiming to be a Henna tattoo artist. He brought us into his home and proudly pointed to a stack of papers on a shelf – “awards” he’d won as a Henna artist. Sensing that he was probably not really trained in Henna at all, but not really caring either, I agreed to get a tattoo on my arm, and he guaranteed that it would last “3-4 weeks”. He decided to do a custom design based on my shirt I was wearing. It took him about 20 seconds to complete, sloppily throwing his Henna pen around on my arm. I probably could have done a better job, and I was quite glad when it faded closer to, I don’t know, 3-4 days, as opposed to the promised amount of time. With my Indian look now complete, we resumed our trek to the fort entrance. 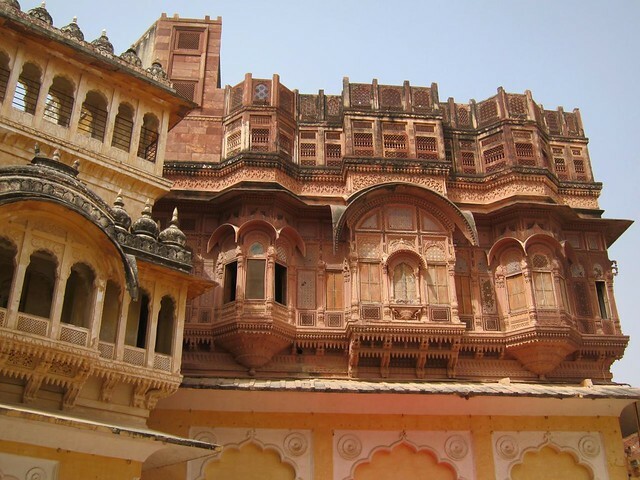 Mehrangarh fort was a beautiful, impressive stone structure, featuring a coronation throne, ornate living quarters, entertaining rooms, and separate female-only havelis, where the wives of the maharajas were able to peek out on the happenings in the courtyards without being seen by the men below…. Handprints by wives of the deceased majaraja, just before throwing themselves on his funeral pyre to die by his side. 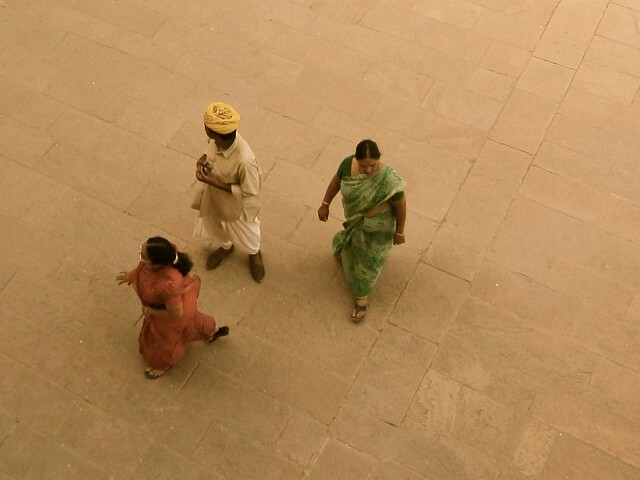 The remainder of our days in Jodhpur were spent walking the streets of the Old City– a simple activity that sounds so nice and quaint, made dramatically more difficult and dangerous by the dodging of motorbikes while playing poop hopscotch. Just when I thought I had acquired a knack for avoiding the majority of poop on the ground, I felt something hit the side of my head– scott confirmed my worst fears- pigeons. Some of the locals who saw what had happened thought it was just a riot. Another guy strolled up to us casually as he was passing by– “Pigeon?” We nodded, as Scott tried to scrape it out of my hair with some cardboard we found on he ground (which was almost certainly also covered in poop!!). 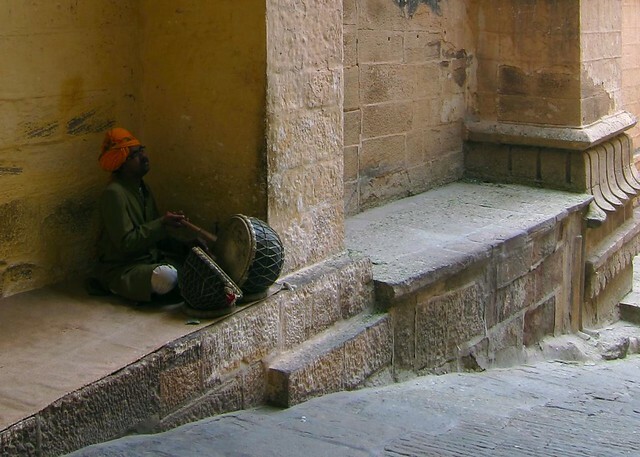 Droppings aside, Jodhpur was our first introduction into Rajasthani food (great segue, yes?) – somewhat different than the food we had come to know and love from Indian restaurants in the U.S. (said to have more of a Punjabi influence, rather than Rajasthani). Breakfasts consisted of parathas– pan-fried flat cakes stuffed with shredded onions and potatoes, served with a seriously salty/vinegary (and I might add bathroom-cleaner-esque) pickled vegetables and curd (unpasteurized yogurt, which could have used some of the bathroom cleaner perhaps). Lassis (yogurt drinks) were also on the menu, as we expected, but we only needed to order those once to know that the yogurt in India is a bit more “gamey” than it might be at home. For dinner, we were usually served a thali, a set menu of ~5 small dishes (stewed lentils, pickled vegetables, curried vegetables…), served with rice and chapatis. Meat was never on the menu, from what we could tell, and neither was alcohol (though you could order a “special coffee”… code for beer) Many of the Rajasthani dishes were prepared with even stricter requirements than a typical vegetarian diet; our favorite restaurant in Jodhpur had several “Jain” (a strict form of Hinduism) dishes on the menu, which were required to be free of any onions, garlic, and potatoes (considered to be foods that slow down your body, rather than provide energy and focus for productive meditation). 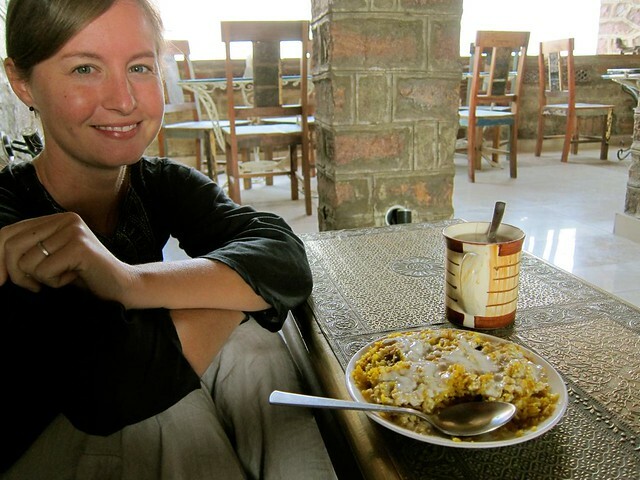 This Jain breakfast (below) consisted of yellow rice with raisins and sweet plain yogurt on top – it was delicious! You should have used cleartrip.in for railway bookings! The site is a delight to use. Wow, we tried Cleartrip and it did look really great but it ended up not working for us. We needed an Indian phone number to get an account and unfortunately, each of the 6 or 7 sims I bought during our time there were cancelled by their carrier 2-5 days after activation! We tried everything to get a sim the “proper” way, using passport, photos, and visa copies, but every time it seemed it wasn’t enough (tried all carriers too: vodaphone, idea, and airtel. B&L seemed to be more clearly for Indian residents only). Very frustrating. We heard later that you can only maintain a sim card in India if you can prove your Indian mailing address… we still have no idea how non-residents can get one! 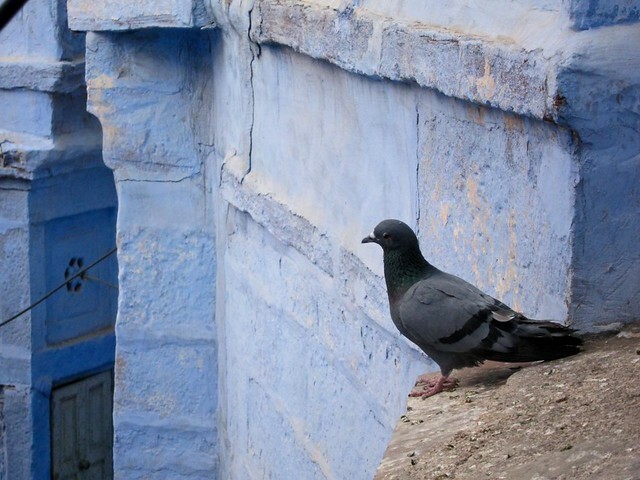 Jodhpur is where I was born and spent a good part of my childhood. Delighted to read your blog. You have been able to very beautifully capture the sights of this wonderful city through your pics. Mehrangarh at night pic is simply awesome. Kudos ! btw , got to know about this blog from a closed group on Facebook which is basically people from Jodhpur living in different parts of the world. Your blog is definitely doing the rounds and getting spoken highly of!